He sounded closer. What a surprise. Stalker. I quickened my pace, when he stepped in front of me, making me jump. I saw my words sting him, but I didn’t care. I couldn’t. He had his chance. I turned and started past him. Two students walked by, staring, and Liam fidgeted. “Can I give you a ride? We can talk in the car. Please? This is kind of private.” The classmates whispered to each other, giggling as they continued on their way. It hurt. I wanted so much for it not to, but it did. “Goodbye, Liam.” My lip trembled and I bit it as I started to walk away. Blog Tour Information Is Up! For those of you who aren’t familiar with the concept, role playing games are writing games in which several writers in the ‘game’ each take on a particular character or characters. Together they interact by email or post while in character to weave through plots, subplots, etc. The idea, is that although the basic structure of the plot is laid out, each player/character will not know how the other players are going to react, thus making the writing experience more ‘life like’. Role playing games have definitely helped improve my writing, and continue to challenge me to this day. My creative energy stays flowing and moving forward. It has also given me the wonderful opportunity to meet some amazing people. 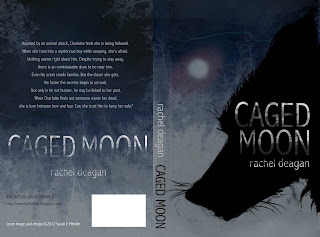 YA Paranormal Romance - CAGED MOON now on Sale!! CAGED MOON'S grand debut is here!! Now available on paperback and e-versions. Keep your eyes open for Caged Moon's February Blog Tour! Dates and Specifics coming soon. Tomorrow's the day!! Caged Moon will be available in paperback and ebook on Amazon, Kindle, Nook, and Smashwords. Look for full links tomorrow!! Free Valentine's Day Giveaway - Caged Moon!! To enter the contest, please post a comment below. Each comment will be tallied as a "ticket" that will be drawn, in lottery fashion, on February 14, 2012. Winner will be contacted and posted on the site. No. I wanted to be an actress and an Olympic Equestrian Rider first. Funny thing is, in fourth grade I wrote my first ‘book’. It was about horses. Although, the equestrian dream has fizzled over the years, I do think my love of acting helps greatly in developing and feeling out the characters I write. 2. What inspired you to write Caged Moon? The premise of the book was inevitable, but I wouldn’t have written the book if I hadn’t met a wonderful friend of mine. She was my true inspiration to follow through with my dream to write. 3. What kind of advice or inspiration would you offer to those wishing to write? Just do it. I always say, the hardest thing about writing a book, is just making yourself write it. I know so many people who are awesome writers and write all the time in various writing role playing games who tinker with the idea, but never do it. It’s amazing to think how many books they could have written with the amount of wonderful writing they just ‘play’ with. Just do it. Go for it. The only way you can fail, is not to try. 4. What kinds of books are on your bookshelf? What are you reading now? 5. Are you working on anything now? This week has been very busy fine tuning and getting things ready for Caged Moon's release date, but things are going great! The video's out, the book has been formatted to go. Everyone has an opinion, and as writer, I know I am guilty of wanting to make everything perfect. So, I find myself asking for a lot of opinions from others to validate my feelings on a subject. The problem is, a lot of times, instead of lifting my confidence about something I’ve created - that I’m actually secretly proud of, it makes me feel more sub-par, and thus in need of more self-validation from others. Now don’t get me wrong, some good solid criticism is extremely beneficial and appreciated, but should we, as writers, throw away our own sense of art for the thoughts and opinions of others? What if Van Gough agreed with people that his art was too abstract and that no one would ever buy it, and then he formed to that conformity? I think we/I need to put things in perspective. Every single person out there likes and appreciates difference things, and certain things set them off. We are all from different backgrounds and have varying preferences of taste. No one person views things the same way. I am a true believer in honest criticism, (let’s face it, it is needed) especially in the writing world, but NOT at the expense of one’s own sense of art. If I’m looking for everyone’s personal ‘okay’ on something, it’s time to re-evaluate what I’m doing here. ‘Cause let’s face it, THAT is NEVER going to happen. What is important, is MY okay, because when it comes down to it, that’s all that matters.